I'm baaaack! Dinners have been a bit hit or miss lately and I find myself losing track of new recipes I've tried and that we all liked so back to blogging I go! My goal is to get a little more organized in the kitchen, try some new foods and to get a little better at taking pictures. Thought I'd start out with an easy post -- my menu plan for the week! 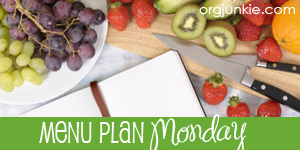 BTW, it's Menu Plan Monday at I'm an Organizing Junkie again. Be sure to stop by and check out all the other delicious menu plans at I'm an Organizing Junkie. Thursday - Date Night! Out for dinner! Saturday - Marsala Burgers, Seasoned Roasted Potatoes, and whatever veggies I pick up at the Farmers Market this morning!